Hello! 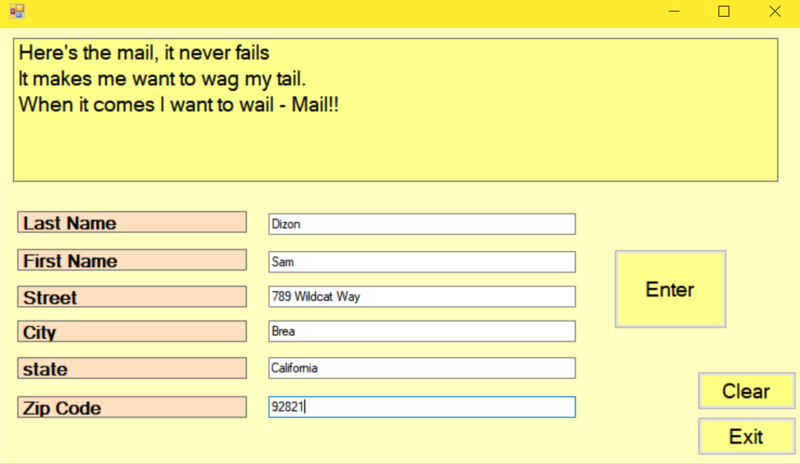 My name is Samantha Dizon, and this is my webpage for GITA 1. I'm learning how to create Windows Apps using C#. You can download C# HERE. My goal this school year is to continue to expand my knowledge of computer science by thoroughly understanding the content of this class by being responsible, diligent, and curious. This program showcases the work of how buttons can be used to hide and show different images and text by translating "Goodbye" into different languages. In "Help Page", the user can press different buttons and images to change other images. The user can also change font size and color. This program takes in the information of the user (like name, address, etc. ), and puts them into a mailing label. 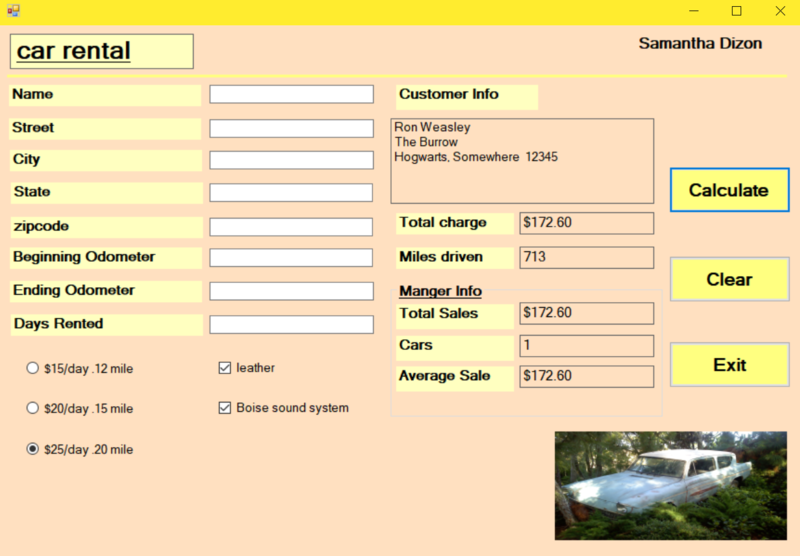 In "Car Rental", the user's info is entered in and displayed, along with manager stats and total miles/prices. 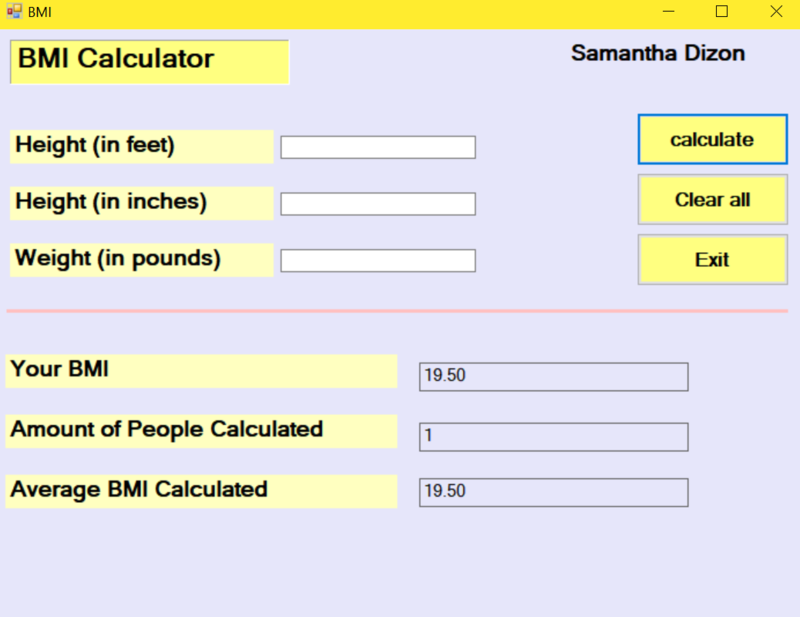 This program takes the user's height and weight, and calculates their BMI. "Car Rental 2" is the updated version of "Car Rental". 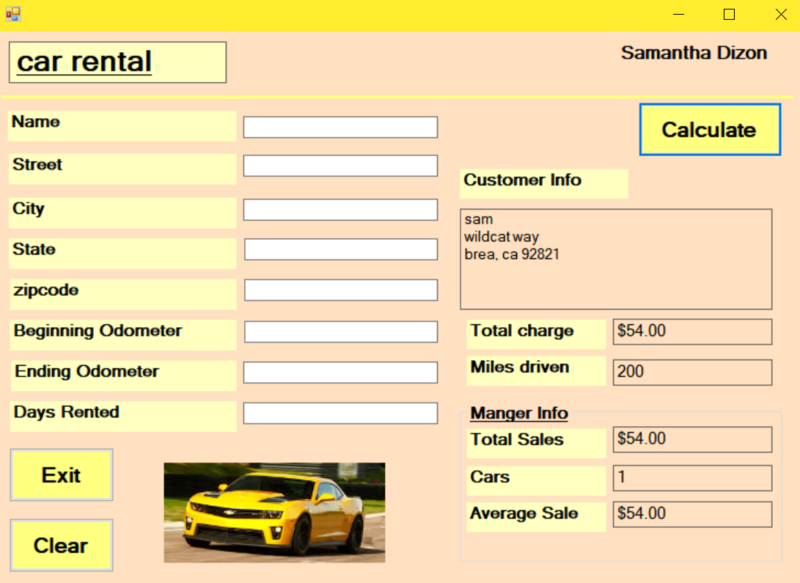 It allows the user to choose between different cars with different prices while still calculating manager stats and total miles/prices. This program takes two different test scores and gives each their letter grades, along with calculating which is score is higher and the average of both. 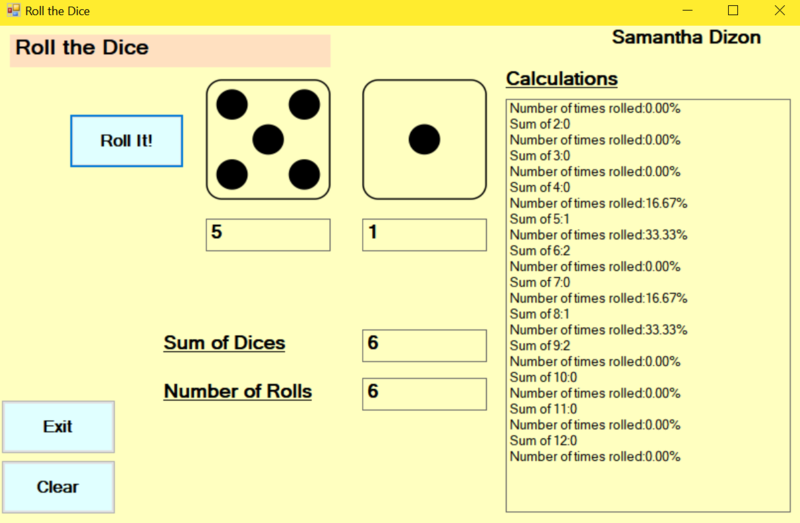 "Dice Game" practices random numbers and displays the perecentages of how many times the user rolls a specific number. 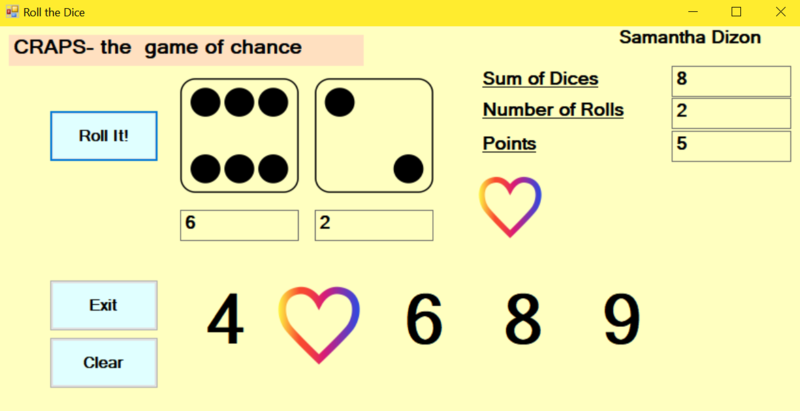 "Craps Game" uses the skills of random numbers and images to create this fun game based off chance. 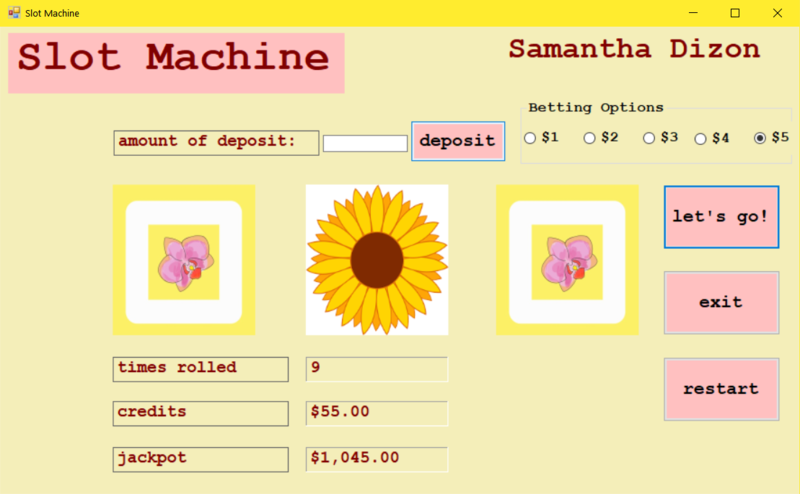 This program uses random numbers and images to make this gambling game. In order to win the jackpot, the user must bid money to continuously try to have three of the exact same images in the machine. 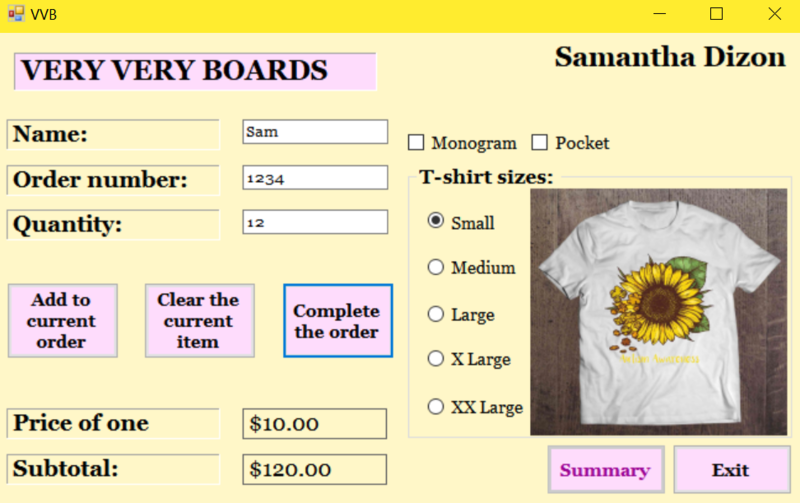 "T-Shirts" calculates the cost of buying multiple different shirts with the choice of different accessories and sizes, and displays managers store totals. In this program, the user can select between two college football teams. Each team also has the option where the user can choose a year that team played in a college bowl, and displays whom they played against and the game results. 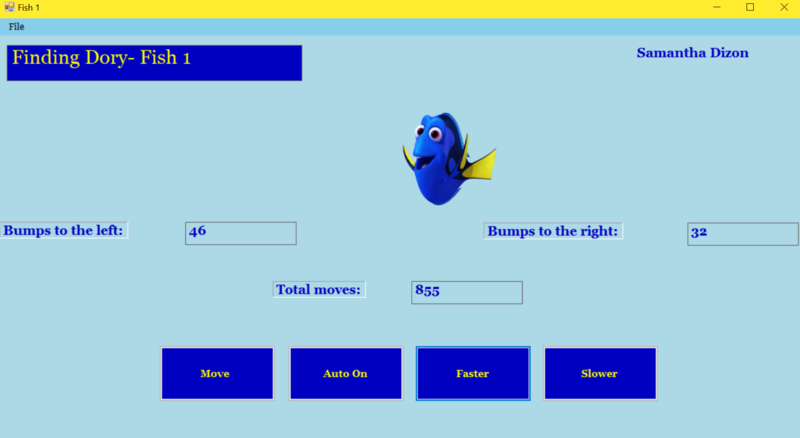 "Fish 1" (Finding Dory) generates random numbers, allowing the user to randomly move Dory left and right. 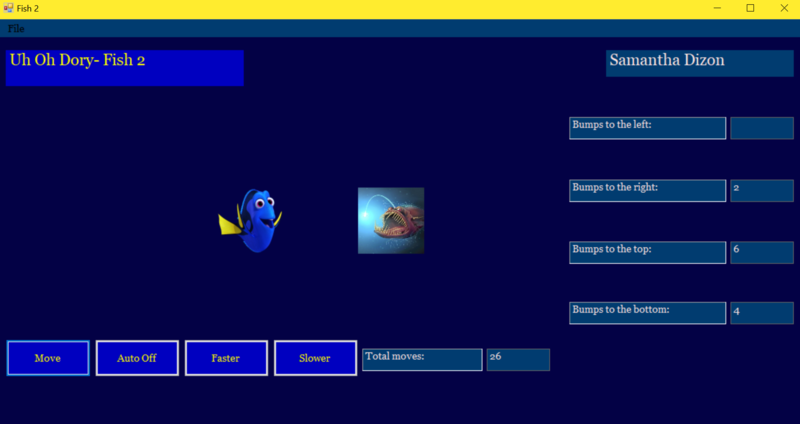 "Fish 2" (Uh Oh Dory) is just like "Fish 1", but now on a 3 x 8 field with an enemy fish lurking to eat Dory. This program allows the user to enter a number. 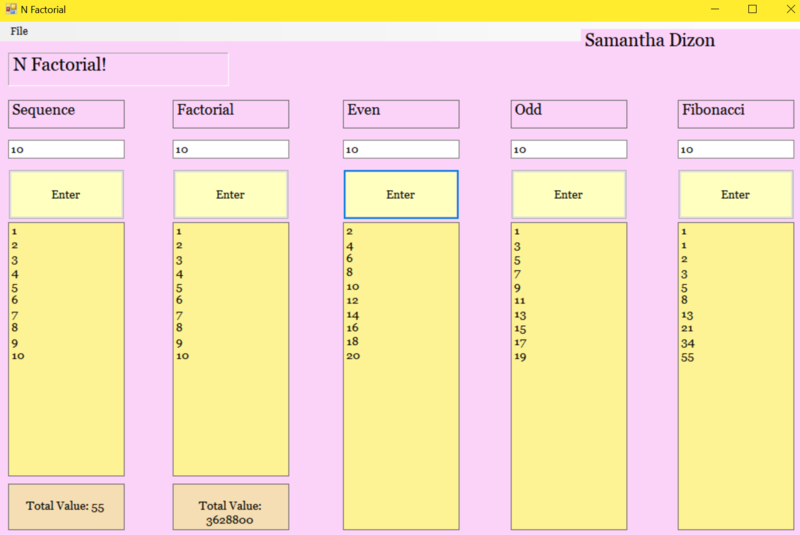 Its sequence, factorial, even, odd, and fibonacci numbers will be shown. 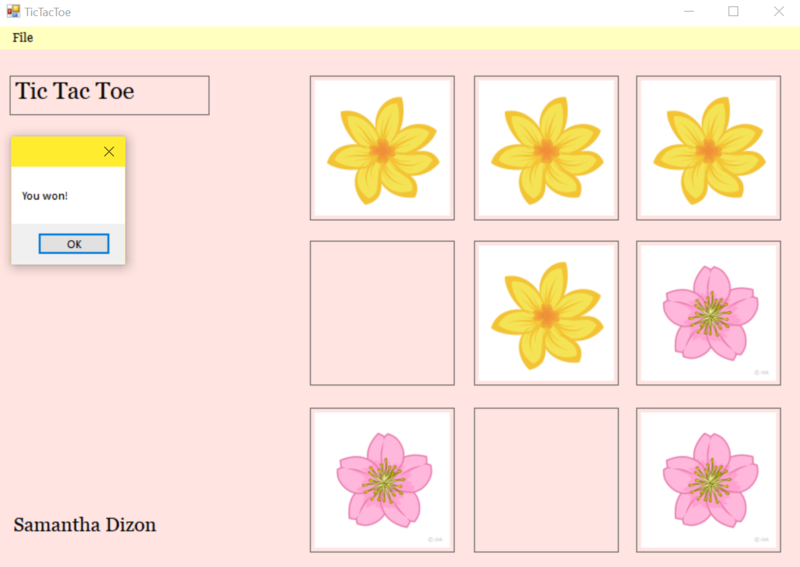 Two users can play "Tic Tac Toe" by taking turns of clicking different picture boxes. The user who has three of the same images lined up next to each other wins! 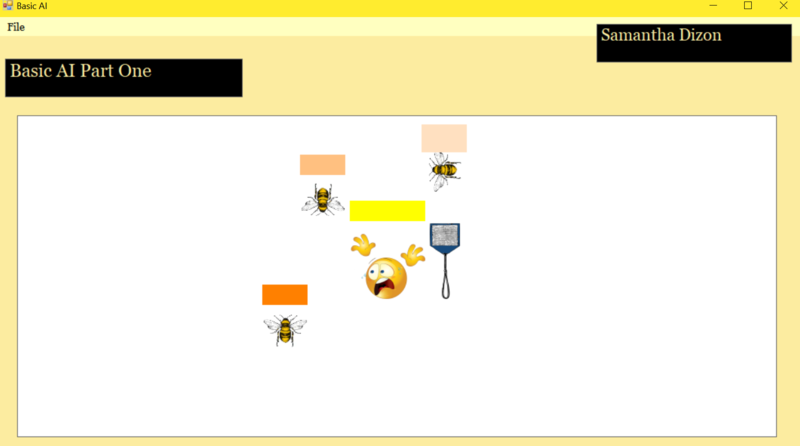 By playing this program, the user is getting chased by three mean bees, and must try not to get stung by them. In turn, the user can try to shoot a fly swatter to defend themself. If they can swat all the bees without losing all their health, they win! 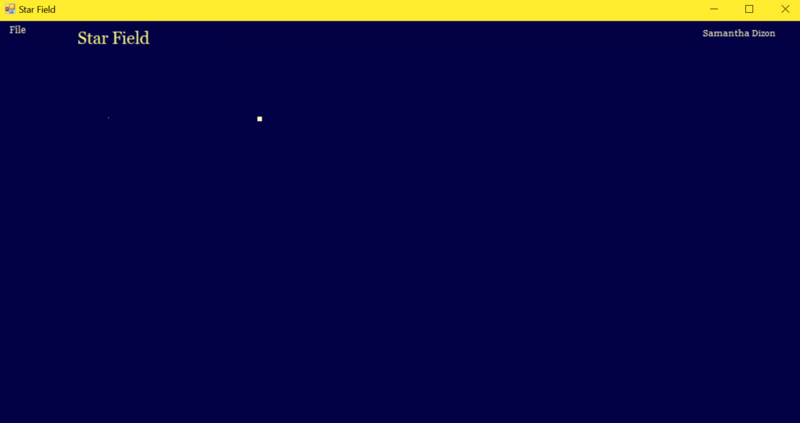 In this program, the illusion of moving stars is created. 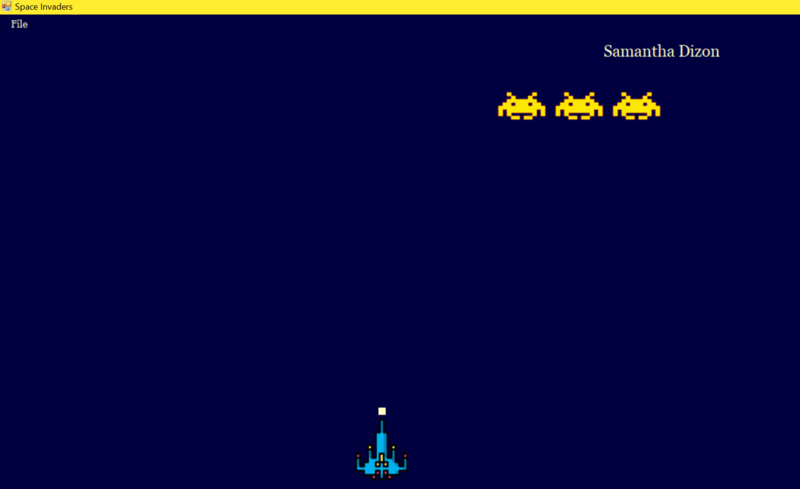 This version of "Space Invaders" is a lot more simpler and smaller than the original game. But, the goal of survival and shooting the invaders is the same.